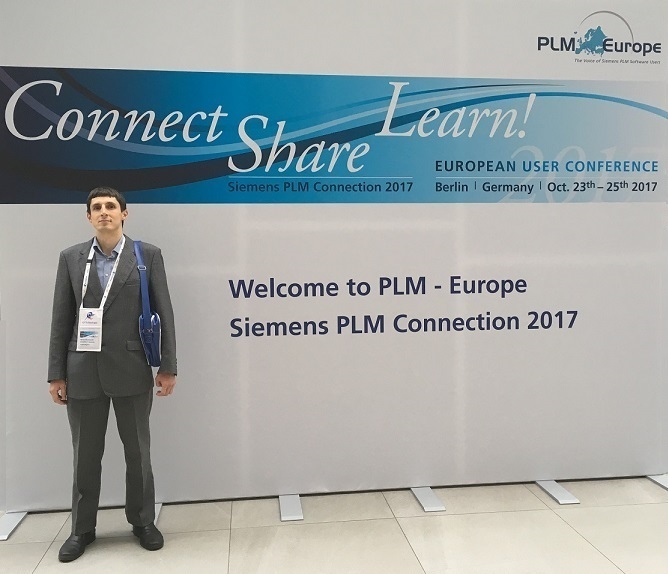 Close to 1.100 participants from 36 different countries took part in PLM Europe 2017 in Berlin, organized by Siemens. 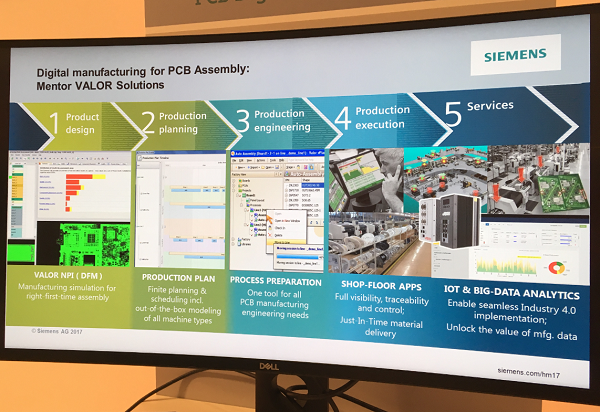 Siemens is leading provider of PLM (Product Lifecycle Management) and ALM (Application Lifecycle Management) Solutions. 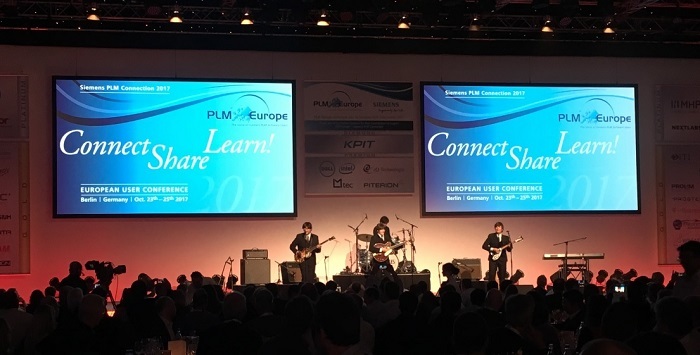 PLM Europe is a great channel to network with users of Siemens PLM Software internationally, and from 2017 also with users of Polarion ALM (acquired by Siemens in 2017). 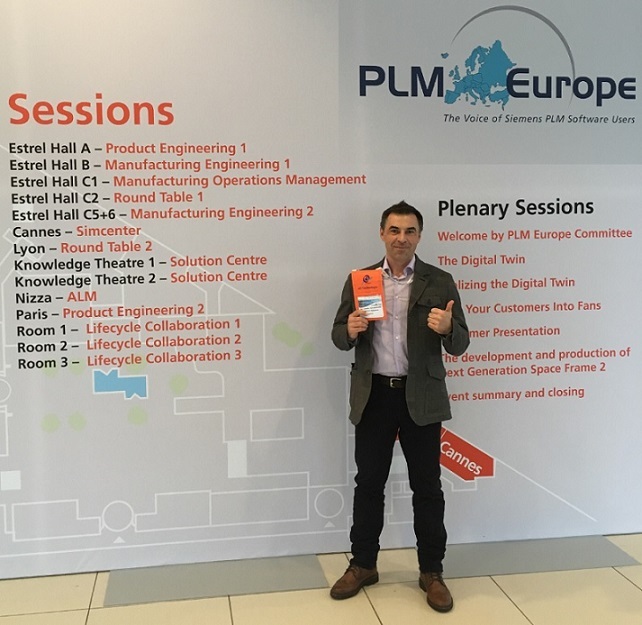 See you at PLM Europe? 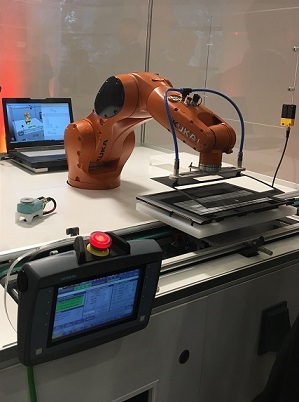 "Vorwerk: Modern Times, Polarion ALM and Teamcenter for an IoT Product"
There is a lot news expected about PLM, PLM+ALM (with latest Connector 1.3) - how Teamcenter and Polarion ALM can be used together. 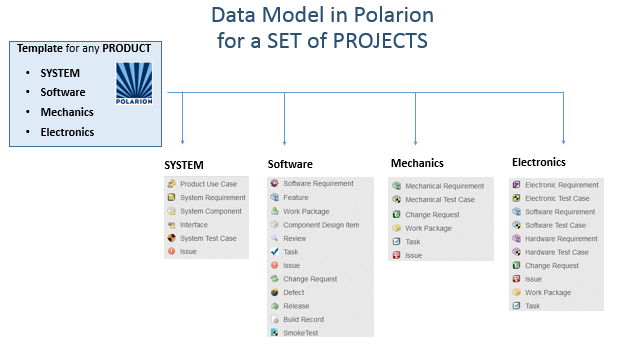 At the same time for Polarion experts will be interested news about Polarion features, which can be used in any Software or System development project (also without PLM). One of the interesting latest released features is the Drag&Drop Planning Board. Automation. "Digital Factory" - was the main theme of the conference. 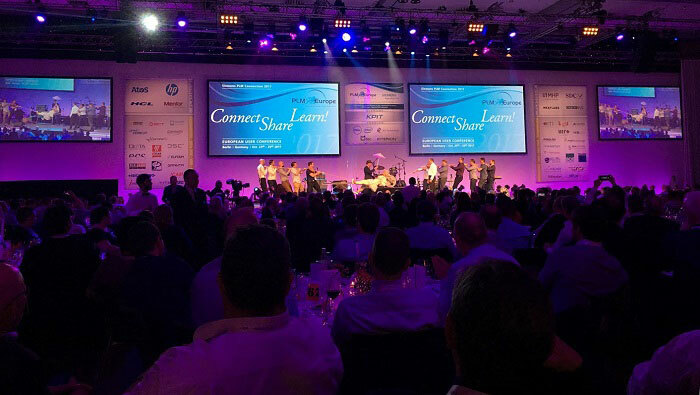 Gala Dinner and Show Hosted by PLM Europe User Group. On stage - "The Beatles"
Entertainment after a busy day. Our presentation topic: "Vorwerk: Modern Times, Polarion ALM and Teamcenter for an IoT Product"
Polarion ALM in Embedded Systems Development - Closing the Loop. 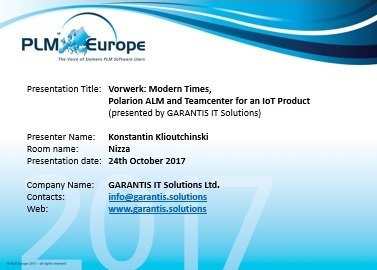 Representatives of GARANTIS IT Solutions among speakers at PLM Europe 2017. Polarion AND Teamcenter? What is the Present and Future? Polarion and Teamcenter in 2017 have better integration - the Connector v1.3.0. It is much better than Connector 1.2.0 from the last year 2016. The integration works only in ActiveWorkspace. In Rich Client of Teamcenter you will not be able to see links to/from Polarion. There are no plans to provide such functionality in Rich Client. So you need to get used to ActiveWorkspace, if you want to use ALM+PLM capabilities. There is no need to switch from Teamcenter to Polarion or from Polarion to Teamcenter. Each product is designed for specific area of work: Teamcenter allows to store and process Design CAD data, Polarion is oriented on text and documents data. 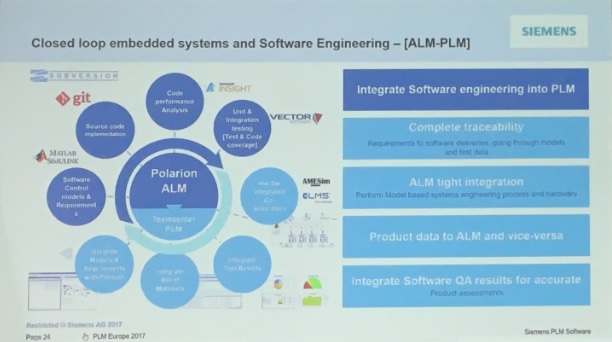 Each product has own advantages, and together they allow to solve Product Development tasks : Teamcenter can be PLM tool, and Polarion - ALM tool. For example, for Software Development it is better to use Polarion. But for hardware parts and mechatronics - Teamcenter (with some information stores in Polarion). A lot of research and development work is going into integrate Teamcenter and Polarion. There are already some examples of this integration working. Next steps are to make it "more smooth" , "more natural", to provide more functions and satisfy requests from customers. There was a lot of information about Digital Factories, Smart Factories. You could even visit a demonstartion room called "Digital Factory Experience". The main idea of Digital Factory: to have complete continious chain from Product Concept to Product Design, and then "feeding" the design documents to robots in Digital Factory, allowing them to make the product (or parts) autonomously. 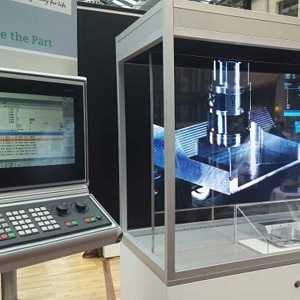 Even though Polarion does not have direct link to Digital Factory concept, it will be part of the PLM/ALM solution and consequently can be/will be used together with Teamcenter to describe Specifications and Design, or to manage Requirements, Defects, Change Requests etc. Technichaly Teamcenter has (will have) programming interface to the machinery in the Factory and can control manufacturing process. Good examples were Local Motors, who 3D printed complete car. 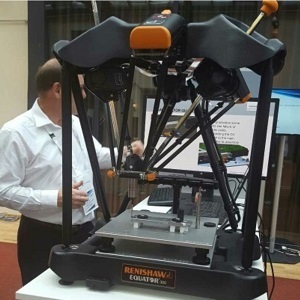 This year the topic of Digital Twin was as popular as the last year. 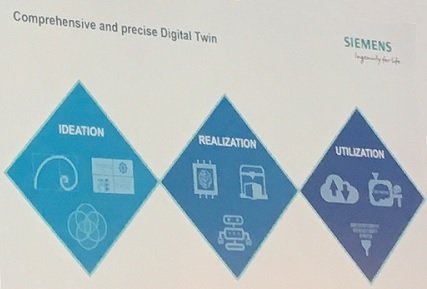 Siemens is working hard to provide tools for creation, analysis and maintenance of Digital Twin. Starting from the first day there were many presentations about Polarion in Room "Nizza". Polarion development roadmap for 2018/2019, future plans and planned features in Polarion. 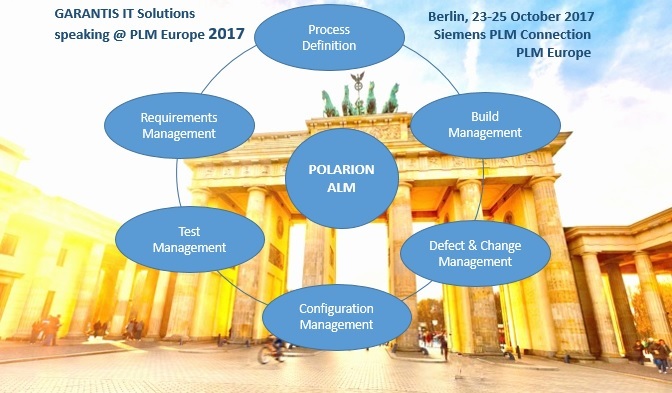 demonstration about integration of Polarion+Teamcenter, ALM+PLM"
Below is the list of some presentations selected by us. We give short description and our recommendations/comments. 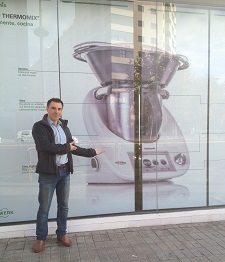 CUSTOMER STORY:The company wanted to use Feature Driven Development (FDD) approach to accelerate development of software for the Thermomix TM5 product. Polarion was chosen as ALM tool, but it needed to be adapted/customized for FDD. In our presentaion we follow the development of Polarion projects from the past, into present, and we try to look into the future. This is a Case Study about Customization of Polarion, It describes specific technical solutions for Feature Driven Development customization. Also we touched topics common for all projects: * How to convince management that customization is needed? * How to administer multiple projects and propagate changes effectively? * What do you need to customize? * How to inform team about customizations? 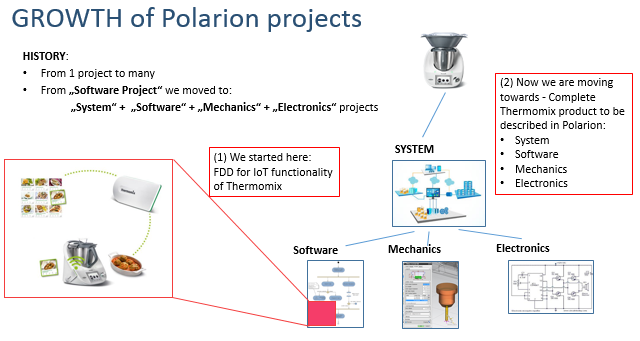 For an IoT product development we recommend to use a set of projects in Polarion: (1) System, (2) Software Development, (3) Mechanics, (4) Electronics. These projects contain different Workitem Types and have different workflows to serve better the specific needsof each domain: Software, Mechanics, Electronics. Very good overview of SAFe template (to be released soon): possibilities, who shall use it, why to use it. You need to introduce 'Enterprice Agile' step-by-step, not "one button click". Allow organization to align with SAFe. There are many variations, you might need to adjust SAFe to your processes, to your organization. 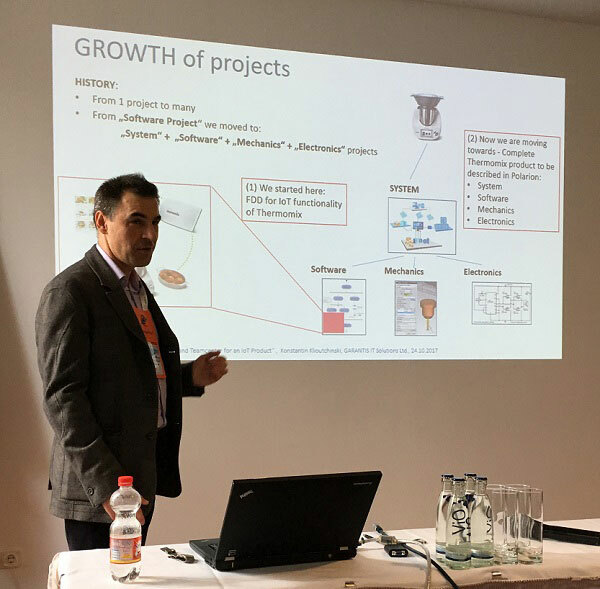 This presentation described experience of introducing ASPICE into automotive project (Automotive SPICE PAM 3.0 and ISO 26262 for ASIL-D projects). There are big plans to improve conenction between Teamcenter and Polarion. 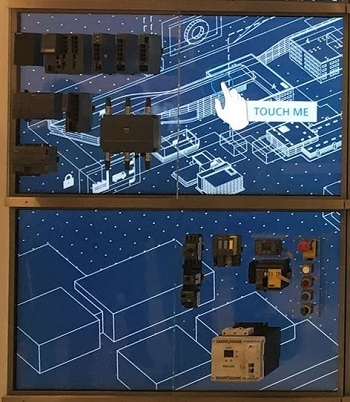 At the moment the connection already exists and is implemented by "Connector". "Connector" allows to establish links between elements in Teamcenter and Polarion. In Teamcenter you can click on the Link and you can see content of Polarion work item (in Active workspace). Later additional functionality will be added, such as "semantics" of the lniks; reports, which show items from both Teamcenter and Polarion. Next update of Connector is planned in 2017.
https://www.berlin.de/ - official website of Berlin city. http://www.a-trane.de/ - International Jazz Club in Berlin. Address: 10625 Berlin - Charlottenburg (Postadresse Pestalozzistr. 105). Being one of the world’s biggest cities and thanks to a huge diversity of attractions, cafes, music venues, not-to-be-missed museums, art galleries and historic places, there is no end of things to do in Berlin. Take a stroll along Museum Island, a UNESCO-listed World Heritage Site lying in the middle of the river Spree. For the magnetic panorama of the city the TV Tower (Fernsehturm) and the Victory Column (Siegesseule) are great places to go. 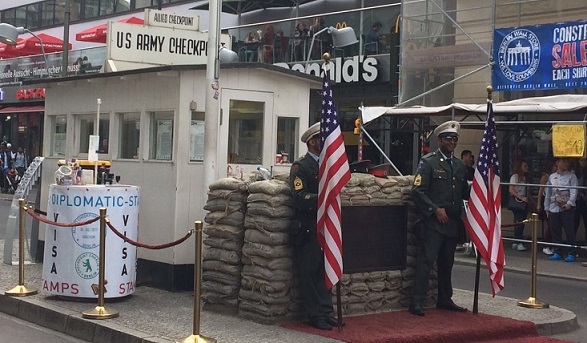 Walk along the Berlin Wall and visit Checkpoint Charlie, the famous east-west border control during the Cold War, to experience the spirit of that time. The East Side Gallery is a former section of the Berlin Wall. Artists have turned it into the largest open-air gallery in the world with over one hundred paintings. 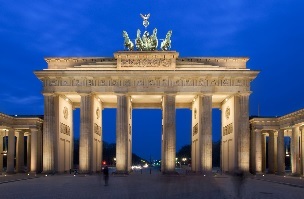 Visit Berlin's most famous landmark ― Brandenburg Gate. A symbol of Berlin and German division during the Cold War, which is now a national symbol of peace and unity. Explore picturesque paths of Tiergarten park to hide from urban hustle and bustle and to enjoy a refreshing drink at one of its many beer gardens. Visit the Olympic Stadium (Olympiastadion), where the German Cup Final and prominent music concerts take place. For chocolate gourmets there are two irresisitibly tempting places to visit: the Colorful Ritter Sport ChocoWorld site at Gendarmenmarkt, which makes Berlin the capital of chocolate and where you can design your very own chocolate bar, and Rausch Schokoladenhaus, where you will be undoubtedly enchanted by the unique world of chocolate. Berlin is a city, which never sleeps. For nightlife lovers there are some great restaurants in Hackescher Markt – a rare example of art nouveau architecture in Berlin and a vibrant urban quarter combing art, gastronomy and entertainment. It is one of Berlin's top entertainment hubs, popular with Berliners, tourists and club-goers since the 1990s. 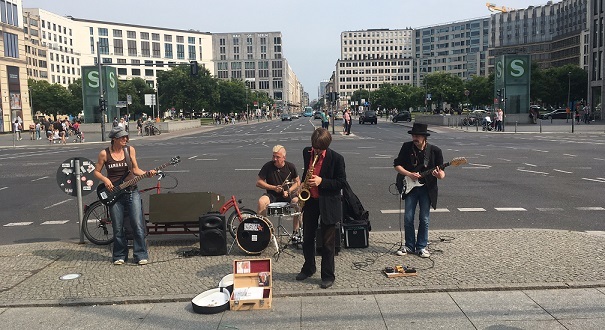 Since the 18th century Berlin has been an influential music centre in Germany and Europe and attracts musicians from all over the world until today. Visit the International Jazz-Club A-Trane at Bleibtreustraße 1/ Ecke Pestalozzistraße to explore international jazz tunes with a glass of refined wine.